When is a maximum not really the maximum? When it's a maximum for an explicitly or implicitly modified default. Whether "the definitive documentation" says so or not. Yesterday on Twitter #sqlhelp this question came up. Aha! I thought to myself. For this I am purposed! To show how Perfmon and DMV data tie out! Indeed the internal resource pool defies limitation by the Resource Governor; the sum of resource semaphore target_memory_kb values for that pool is the true maximum workspace memory limit for the SQL Server instance. But is that number necessarily the same as is reported by "SQLServer:Memory Manager\Maximum Workspace Memory (KB)"? But there are wrinkles. As it turns out, the number reported in that perfmon counter is the sum of resource semaphore targets for the default pool. Two factors can cause the default pool resource semaphores' targets to be lower than those of the internal pool: conditions in the max_memory_percent and min_memory_percent of Resource Governor pools other than the internal pool. Consider what happens when default pool max_memory_percent is changed from 100 to 50, with min_memory_percent remaining at 0 for all other pools. The RP_maxmem_100 pool still reports the same sum of target values as the internal pool. Both of these pools report a total number twice as large as the default pool reports. And its the default pool's sum of resource semaphore targets that gets reported by "SQLServer:Memory Manager\Maximum Workspace Memory (KB)". OK, now lets bring default pool max_memory_percent back to 100. What happens if a pool other than default has a nonzero min_memory_percent defined? Pool RP_maxmem_100 has min_memory_percent 27 in the example below. Remember, the internal pool is unphased by design. No other pool has a minimum memory set, so the sum of Pool RP_maxmem_100 resource semaphore targets is the as for the internal pool. But the default pool now has a semaphore target total and "Query exec memory target" value of 100% - 27% = 73% => 73% * 192890640 = 140861040 (when rounded down to the nearest multiple of 8k). Now you know... the rest of the story. I invest time in trying to fit pieces of memory together, to understand how various types of accounting for database memory work... and work together. 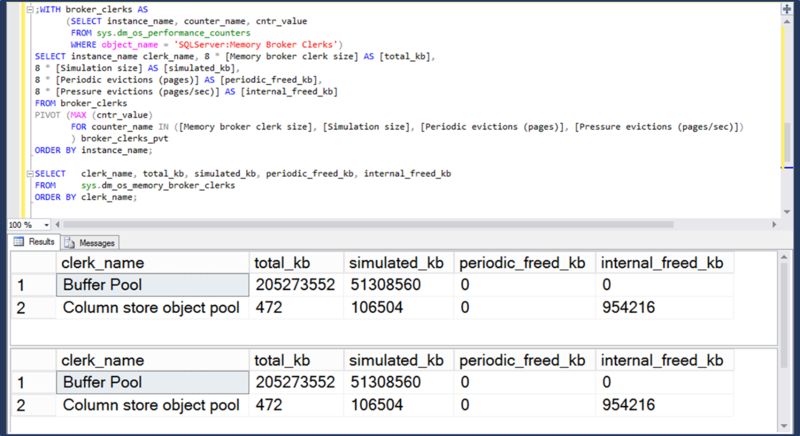 But today for the first time I tried to tie out sys.dm_os_memory_broker_clerks with equivalent counters from sys.os_performance_counters - the counters we get in perfmon. I was surprised how easily sys.dm_os_memory_broker_clerks could be reconciled with perfmon. First, a disclaimer. The columnstore object pool changes pretty quickly once no queries are running. And sys.os_performance_counters lags behind sys.dm_os_memory_broker_clerks. It seems like values are pushed from the source for sys.dm_os_memory_broker_clerks to the source for sys.os_performance_counters on a regular interval - maybe every 2 seconds. This is most noticeable when the broker clerk for columnstore disappears entirely from sys.dm_os_memory_broker_clerks but is still present in sys.os_performance_counters for a brief time. Doing some additional memory work. This is a great post from Jonathan Kehayias(@SQLPoolBoy on Twitter) on an information source that isn't discussed often. I grabbed one of the relevant XML records, to see what other good stuff might be in there. On my system, I didn't see any values for SharedMemory, AWEMemory, or AvailableExtendedVirtualAddressSpace. MemoryUtilization and TotalPhysicalMemory seem like items I can forgo for now. I started with Jonathan's query as a base, and after some bumping around, I worked it into this query which gathers the stuff from these XML records other than the 5 items mentioned up there. Took me a little while to decide how to flatten out the three Effect nodes per record. And then what really took a while for me to figure out is that each NodeId gets its own ring_buffer_address, so to uniquely identify these XML records it takes Record ID and ring_buffer_address or NodeId. Laerte Junior (@LaerteSQLDBA on Twitter) has a great post on the RedGate Hub. There's a lot of great stuff available in perfmon, and tons of SQL Server-specific stuff available in the DMVs, DMFs, etc. That's when executing some PowerShell via xp_cmdshell can become extremely handy. I started with the code example in the blog post above, and expanded a bit in order to grab all of the process memory information I'm interested in. This ought to help determine if there's something external putting unexpected memory pressure on SQL Server, or if 'max server memory' is simply set too high. This process-level information won't answer that question alone - it'll have to be considered together with some information about SQL Server memory gathered from the DMVs and DMFs. But this is all I have time for today :-) Note: I'm grabbing the 64-bit measures below. If you happen to be on 32-bit Windows, you'll want to retrieve the 32-bit equivalents from Powershell (eg WorkingSet rather than WorkingSet64). And here's a stored procedure to grab the info from Powershell, shred the XML into an EAV table, then pivot into the table structure I want. Excellent. This ought to do nicely.